Please find answers below to the most commonly-asked Westernaires enrollment questions. If you have any additional questions, please consider submitting a question to us via the Contact page, and we'll respond promptly. When do new classes begin at Westernaires? New members are admitted once yearly (in August), so we suggest that anyone interested in submitting an application do so well in advance, as space is limited. We are accepting applications for our August 2019 Tenderfoot class. Our kickoff meeting (which we call "Tenderfoot Induction") is usually held on the 4th Friday evening of August. For 2019, that date is August 23rd, at 7:30PM, at the Jefferson County Auditorium Expo Hall. What ages are allowed to join Westernaires? Boys and girls between the ages of 9 to 14 are eligible to enroll in Westernaires. We don't own a horse, and don't plan to. Can my child still join? Absolutely. Horse ownership is not a requirement in Westernaires. In fact, most of our members do not own their own horses. Rental horses from the Westernaires livery string are available for class rental. My child is horse-crazy but has never ridden before. How much experience is necessary to join? No previous horse experience is necessary to join Westernaires -- just an interest in learning! How much does Westernaires cost? Rental horses from the Westernaires livery string can be rented for $15 per class. Tenderfoot classes are one hour in duration, every other Saturday. All instruction and coaching are provided free of charge. Annual dues are $30 for the year, payable in August; these fees help us pay for the maintenance and utilities for our facilities. 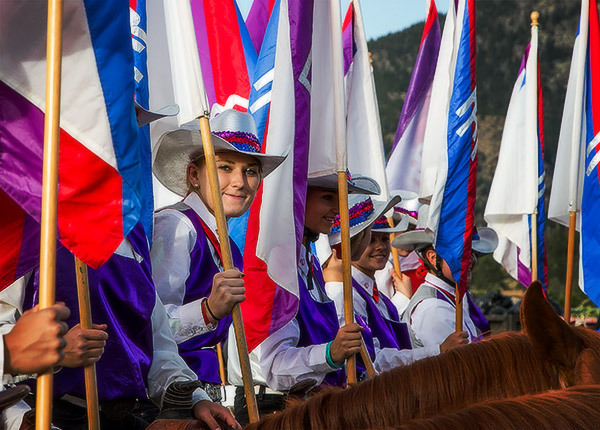 Westernaires Tenderfoot classes ride for one hour every other Saturday. 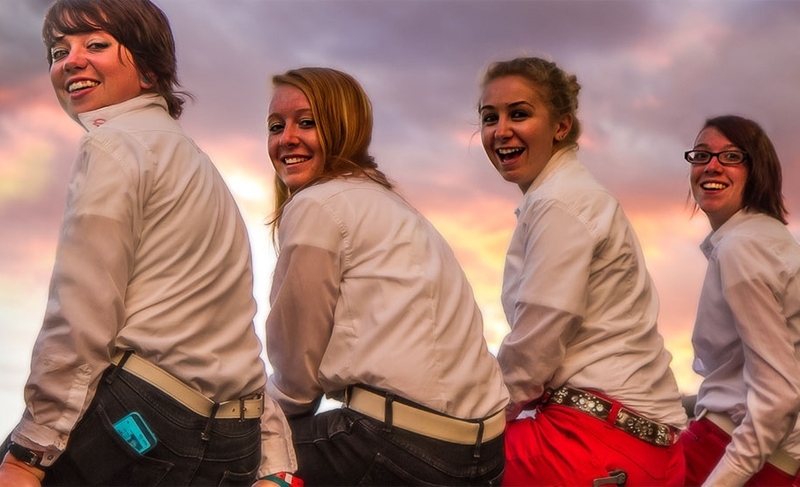 Tenderfeet (as we affectionately call our first-year riders) are also required to attend a few lectures throughout the year on the topics such as safety and horse grooming. Westernaires rides all year round using climate-controlled, covered arenas when the weather is inclement. Is there any special apparel that my child will need? We require that jeans and boots (or shoes with smooth, hard sole, and a substantial heel to help prohibit a foot from slipping through the stirrup) be worn by riders. For safety reasons, we do not permit members to wear the following: shorts / short pants, baggy clothing, or untucked shirts (or other clothing that could get caught on the saddle). 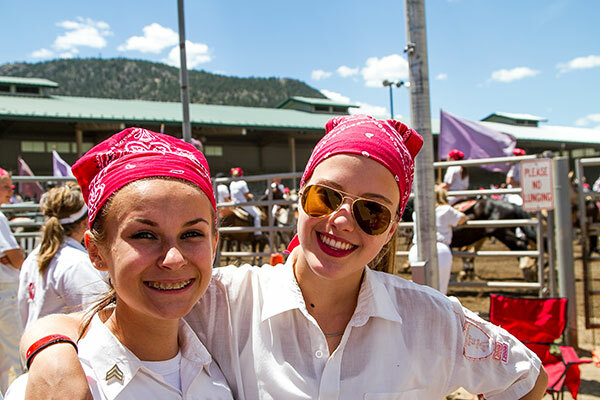 The Westernaire practice uniform is required to be worn by riders by January 1st, and consists of: wheat-colored jeans, white monogrammed shirt/blouse, red side tie, and headscarf for the girls (again, for safety purposes). These items can be purchased from the Westernaires club store. Do I need to be present while my child is in class? Westernaires prefers that parents stick around during their child's riding classes. Not only do the kids appreciate the support and cheering, but class instructors benefit from knowing they can locate a rider's parent in a time of need or emergency. We also ask that parents participate in the occasional kitchen duty (assisting in food prep or cashier duties in our on-premises cafeteria). Aside from these points, we love when parents want to volunteer and get involved! Westernaires is a 100% volunteer-run organization, and we're always looking for more help. Whether you have mechanical, bookkeeping, sewing, or driving skills, we need you! What will my child learn as a Westernaire? Can I learn to ride a horse too? Yes! Westernaires adult riding is offered to any adult who wants to join in the fun. Classes are held on weeknights, and they're ONLY for adults (no kids are allowed, other than the Junior Instructor assistants - who are relied upon heavily!) Three different Adult Ride classes are offered: Beginner, Intermediate, and Advanced. Horse rental is $15 per session. Again, all instruction is free of charge. There is a mandatory orientation meeting offered 2 times per year, at the start of the Adult Ride seasons. Click here to learn more about the Adult Ride program.